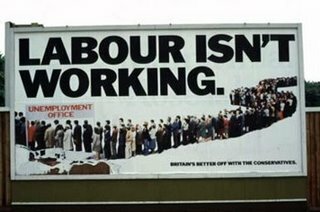 Advertising devised by the Saatchi brothers have been staples of Tory propaganda since those ‘Labour isn’t working’ posters of the late seventies. This is one of the most legendary hoardings in advertising history. As those of us who were around at the time will recall, its impact was devastating. It somehow seemed to stick the final boot into a government that was already in deep trouble. But now comes the end of an era. The Conservatives are reportedly dissatisfied with the services of the M&C Saatchi agency, after forking out £8m for the pretty abysmal ‘Are you thinking what we’re thinking’ campaign last year, and have taken Maurice and Charles off the case. Among the possible replacements is an obviously trendy outfit that trades as Karmarama. Cringeworthy name or what? Its past clients reportedly include the Stop the War Coalition.